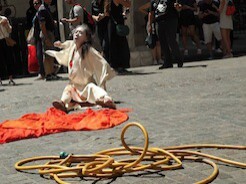 Presented by Lower Manhattan Cultural Council, Eiko returned to the 2016 River To River Festival with her continuing A Body in Places solo project. 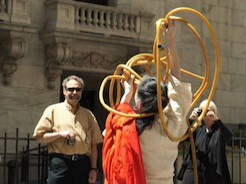 Eiko performed in two sites: on Governors Island in the moat of Fort Jay and on Wall Street in front of the Stock Exchange. In both locations, we are never far from water and all performances were connected by this theme. 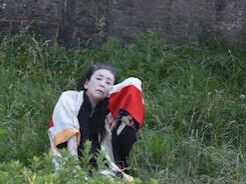 On June 19th, audiences gathered around the edges of the Fort Jay moat to watch Eiko perform A Body on Governors Island below. Her movement in the swaying overgrown grasses brought to mind the water that once flowed there, and the island's complex military past. Despite the bright sun and the afternoon heat, Eiko was able to meet the gaze of audience members. 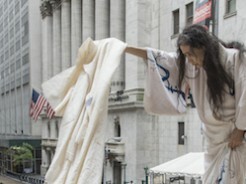 Eiko performed A Body on Wall Street on June 21st and 22nd. Audience members sat on the steps of Federal Hall to watch Eiko dance willfully in front of the Stock Exchange, the architectural symbol of Capitalism. 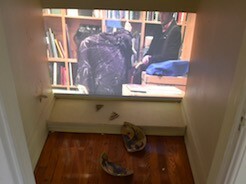 This site was much less secluded than Governors Island, and throughout all performances Eiko was surrounded and sometimes obscured by crowds of people. Her bright red cloth and yellow hose were visually striking amidst the chaos of rush hour, and many passersby stopped abruptly to watch. 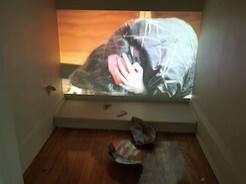 Watch the June 21st performance and June 22nd performance.